EUTERPE was one of the nine Mousai (Muses), the goddesses of music, song and dance. In the Classical era, when the Mousai were assigned specific literary and artistic spheres, Euterpe was named Muse of lyric poetry. 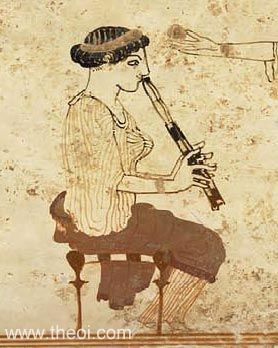 Her attribute was the double-flute. Euterpe's name was derived from the Greek words eu- and terpô, meaning "giver of much delight." "Euterpe--or Kalliope (Calliope), according to some--bore to the river Strymon Rhesos (Rhesus), whom Diomedes murdered at Troy." To each of the Mousai (Muses) men assign her special aptitude for one of the branches of the liberal arts, such as poetry, song, pantomimic dancing, the round dance with music, the study of the stars, and the other liberal arts . . . For the name of each Mousa (Muse), they say, men have found a reason appropriate to her . . . Euterpe, because she gives to those who hear her sing delight (terpein) in the blessings which education bestows." "What about the sons of goddesses? . . . [such as] Rhesus, whose mother [i.e. Euterpe] was a Musa (Muse)."